Rosenstein Impeachment Sputters On Capitol Hill, But Political War Likely Will Rage On A measure that would have removed the deputy attorney general appears to be dead on arrival, but some conservative Republicans are expected to keep up their war on the Department of Justice and FBI. Deputy Attorney General Rod Rosenstein looks likely to keep his job, though he will also likely continue to endure political attacks from supporters of President Trump. 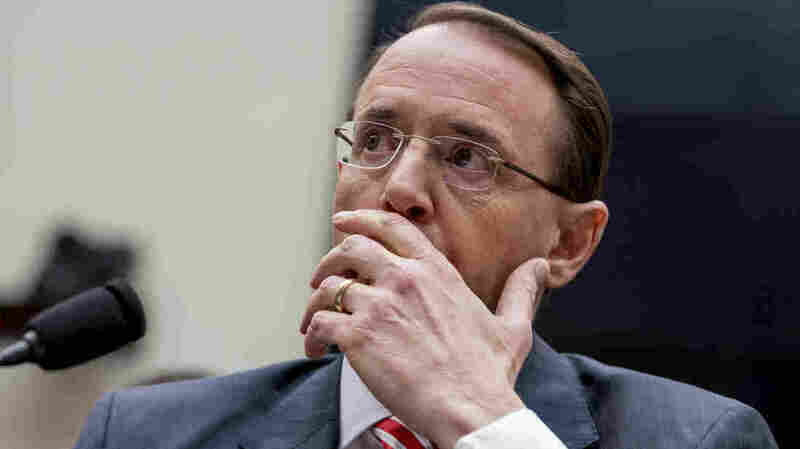 Rosenstein's antagonists, however, led by Republicans Mark Meadows of North Carolina and Jim Jordan of Ohio, have vowed that they will continue to pursue the effort and keep up their campaign against Rosenstein and the Justice Department, which they argue are stonewalling requests for information about the 2016 elections investigations. "Since I got involved we have been getting a lot of compliance from DOJ on documents. We don't have full compliance and we need to get full compliance, but we've been making tremendous progress to that point," Ryan said. Meadows, Jordan, House intelligence committee Chairman Rep. Devin Nunes and other Republicans want documents from the Justice Department related to the use of confidential sources and other aspects of the early stage of the FBI's counterintelligence investigation into Russia's attack on the 2016 election. But Meadows said separately on Thursday that he doesn't intend to give up his push to get more information and more documents from the Justice Department. And Meadows, Jordan and their compatriots now have live legislation in the Congress to tout on their trips home during the House's August recess. They could try to build support for a House vote when lawmakers return after Labor Day, although the attitude of Ryan or other leaders might not be different then. Separately, Jordan said Thursday that he is running for speaker of the House, vying to take over Ryan's spot as Ryan is not running for re-election to Congress in November. Jordan is circulating a letter to House GOP members on Thursday officially launching his campaign for speaker. Sessions, meanwhile, said in Boston on Thursday that Rosenstein is capable and that he enjoys Sessions' "highest confidence." While the absurd threat to impeach Rod Rosenstein will undoubtedly fail, using the Department of Justice as a prop for political theater does lasting damage to this vital democratic institution. The men and women of DOJ and the people of our country deserve better.